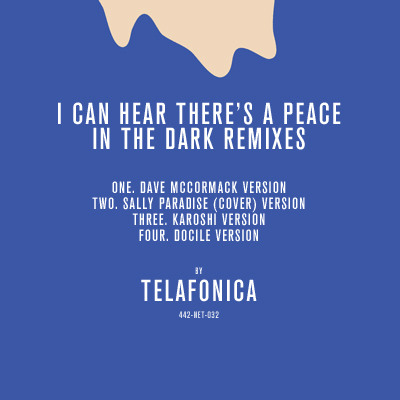 The I Can Hear There's A Peace In The Dark Remixes EP is available for free (or pay what you like) download via Bandcamp. The Sleeping With The Fishermen Remix project took a break in December, 2011, so that the album itself could be released. I Can See There's A Peace In The Dark sees the remixes flow once again. First up is Australian legend, Dave McCormack (Custard, The Titanics, The Polaroids) who picks out the quirks of the track, ramps up the joyful, playful bits and presents a blissed out, summer groove. All artists were given free reign for their remixes - told to do whatever they like with the tracks. Canadians, Sally Paradise, go all out and actually cover the track for their version, creating a luxurious dream-pop with grainy synths, lazy guitars and canyons of reverb. Old friend Karoshi continue their run of sublime Telafonica remixes, glitching up, vocoderising and looping some vocal lines in a half-time stutter of moody atmospheres. America's Docile takes the harmony vocal and turns it into the main melody of a completely new chord structure, filled with piano and arppegiating synths to create music that could be soundtrack the emotional crux of an indie film. If you would like to create your own remix of I Can Hear There's A Peace In The Dark, the original stems can be downloaded for free at tiny.cc/peace-in-the-dark. Download these, create your own remix and send it to contact@4-4-2music.com. We will post all remixes on another Bandcamp page and split any 'pay what you like' earnings 50/50.